Discover Khaiphaen, a vocational training restaurant named after the popular Laotian snack, made of crispy Mekong River weed unique to Luang Prabang. The menu is full of creative Laos cuisine in a family sharing style format, the juices are fresh and the cocktails are addictive! Take a break in our shop. 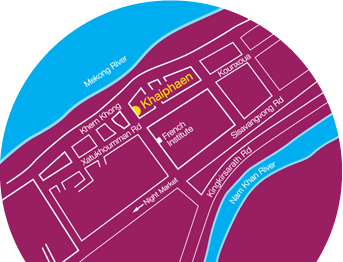 Khaiphaen is run by Peuan Mit, an organization founded by Friends-International in Vientiane in 2004, in partnership with the Ministry of Labor and Social Welfare to address the needs of street children and young people in Laos.